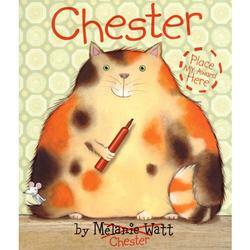 Chester is an egomaniacal cat who tries to take over author Melanie Watt’s book for himself. Ms. Watt struggles to tell her story of a mouse who lives in the country, but Chester (armed with a red marker) just will not stop rewriting it. But Melanie Watt has the ultimate revenge when she gives Chester what he’s been asking for all along. I love this book. It’s very funny, and the idea is fresh. Even the poor mouse weighs in all the interruptions to the story, and I think kids will really get a kick out of this book as a read aloud. There’s also a great lesson in there about being careful what you wish for.